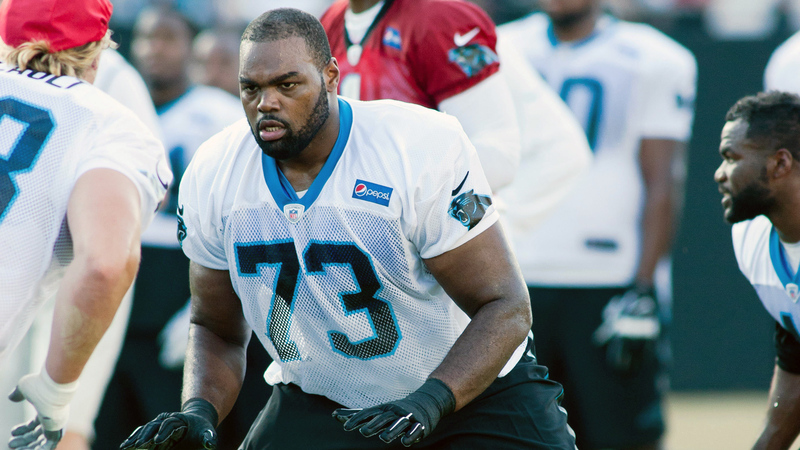 Michael Oher got the nod at left tackle in Carolina’s first preseason game. Fortunately for both the Panthers and Oher, David Newton of ESPN pointed out that his first go-round has to be considered a success. As Newton explains, Cam Newton didn’t get sacked against a strong Buffalo Bills defense during the 25-24 victory. While Oher faced both Mario Williams and Jerry Hughes, his strong play allowed for Newton to get the passing game going after a slow start. When Oher was asked about the game, he didn’t read too much into it, but did call it a great test. “In the preseason, you want to end on a good note," Oher told ESPN afterward. “You look clean out the re, so it was good to score a touchdown and stuff like that. But I’m pretty sure once we see the film, there will be a lot of things we have to work on." “It was a great test for us coming on the road, having to work on silent count, but naturally you’re going to be late off the ball and things like that. Then going up against those kind of guys. … I think they led the league in sacks last year." If Oher can prove that he’s the answer at left tackle for the Panthers, it would be huge moving forward in 2015 and beyond. The line has struggled to protect Newton in recent years, but Oher’s strong play may be the start of something beautiful.